Hot on the heels of Donkey Kong 3 releasing today, another arcade classic is heading to Switch courtesy of HAMSTER’s Arcade Archives. 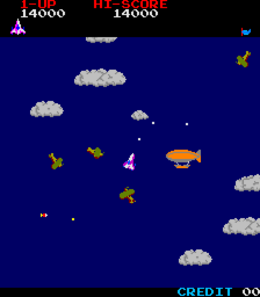 The time travelling airplane shoot’em up Time Pilot, originally brought to arcades in 1982 by Konami, was confirmed for a Switch release next week during a recent NicoNico stream. What makes it noteworthy is that it’s the first Konami arcade game to be released via Archive Archives on Switch. Given Konami is about to release its own Arcade Collection, perhaps the company has loosened up restrictions on the games that won’t be included there? Either way, you can grab Time Pilot on April 11th.